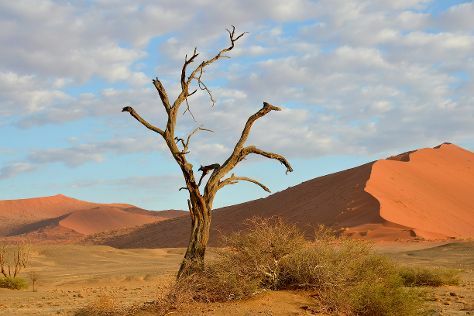 On the 16th (Fri), admire nature's extreme beauty at Sossusvlei and then explore the fascinating landscape at Namib Desert. 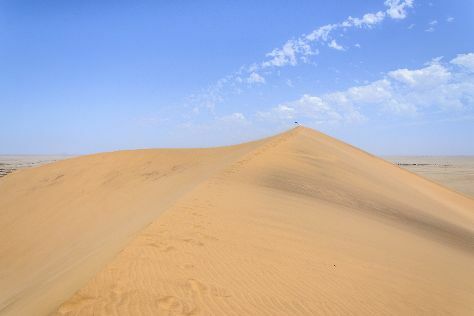 For where to stay, photos, ratings, and more tourist information, go to the Namib-Naukluft Park sightseeing planner. Cusco, Peru to Namib-Naukluft Park is an approximately 41-hour flight. The time zone difference moving from Peru Time (PET) to Western African Time (WAT) is 6 hours. Wrap up your sightseeing on the 17th (Sat) to allow time to drive to Sesriem. Sesriem is a small settlement located in the Namib Desert, in Namibia, close to the southern end of the Naukluft Mountains. Kick off your visit on the 17th (Sat): enjoy unforgettable views with a balloon tour. To see reviews, photos, and other tourist information, use the Sesriem vacation planner. You can drive from Namib-Naukluft Park to Sesriem in 2 hours. Finish up your sightseeing early on the 18th (Sun) so you can go by car to Walvis Bay. Get ready for a full day of sightseeing on the next day: see exotic creatures in open habitats at a safari tour and then surround yourself with nature on a nature and wildlife tour. To see more things to do, photos, traveler tips, and more tourist information, go to the Walvis Bay holiday planner. You can drive from Sesriem to Walvis Bay in 9 hours. Expect a daytime high around 26°C in June, and nighttime lows around 11°C. Cap off your sightseeing on the 20th (Tue) early enough to travel to Windhoek. Step off the beaten path and head to Horseback Riding Tours and Okapuka Ranch. 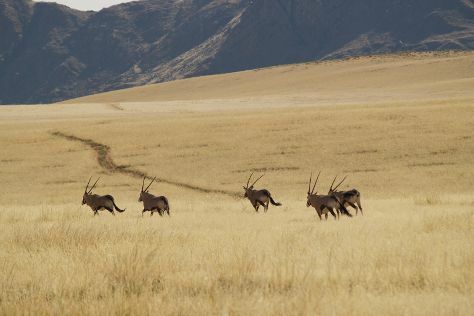 There's still lots to do: identify plant and animal life at NamibRand Nature Reserve, hunt for treasures at Namibia Craft Centre, stop by The Diamond Works, and take an exotic tour of a safari tour. For where to stay, more things to do, maps, and more tourist information, read our Windhoek online itinerary creator. Traveling by combination of flight and car from Walvis Bay to Windhoek takes 1.5 hours. Alternatively, you can take a bus; or drive. Traveling from Walvis Bay in June, you can expect nighttime temperatures to be little chillier in Windhoek, with lows of 8°C. Wrap up your sightseeing on the 23rd (Fri) early enough to travel to Etosha National Park. Start off your visit on the 24th (Sat): don't miss a visit to Okaukuejo waterhole and then stroll through Etosha National Park. To find traveler tips, ratings, other places to visit, and more tourist information, use the Etosha National Park travel planner. You can fly from Windhoek to Etosha National Park in 3.5 hours. Another option is to take a shuttle. 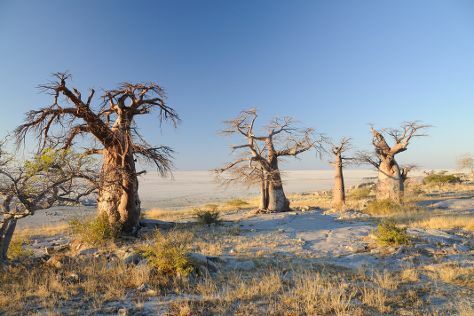 Finish your sightseeing early on the 25th (Sun) to allow enough time to travel to Makgadikgadi Pans National Park. Kick off your visit on the 26th (Mon): look for all kinds of wild species at Makgadikgadi Salt Pan. To see other places to visit, ratings, traveler tips, and more tourist information, read Makgadikgadi Pans National Park trip builder. Use the Route module to find suitable travel options from Etosha National Park to Makgadikgadi Pans National Park. The time zone difference when traveling from Etosha National Park to Makgadikgadi Pans National Park is 1 hour. 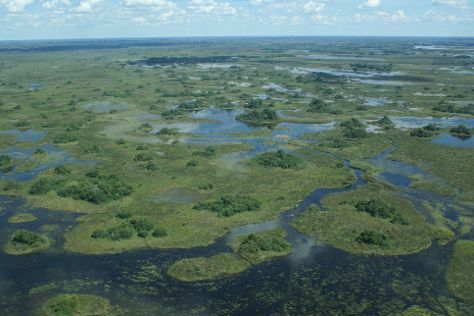 Finish your sightseeing early on the 27th (Tue) to allow enough time to travel to Okavango Delta. Kick off your visit on the 27th (Tue): look for all kinds of wild species at Okavango Delta. Get ready for a full day of sightseeing on the next day: explore the activities along Okavango River. To see ratings, photos, and more tourist information, read Okavango Delta travel itinerary planner. The Route module can help you plan travel from Makgadikgadi Pans National Park to Okavango Delta. Expect a daytime high around 31°C in June, and nighttime lows around 10°C. Finish up your sightseeing early on the 29th (Thu) so you can travel back home.